Krystian Bielik – Polish Prodigy or The New New Bischoff? New Author 14th January 2018 Arsenal, Premier league, transfersTagged arsenal, bielik, EPL, football, footballers, Gunners, premiershipLeave a Comment on Krystian Bielik – Polish Prodigy or The New New Bischoff? Now that the infernal hullabaloo over the transfer window has ended and Jim White’s Ketamine stash has been emptied for another 6 months, we can take a look at our additions. With all the frothing surrounding Gabriel & his move to shore up our backline, you could be forgiven for forgetting about Kristian Bielik; our new midfield starlet. The footballing cosmos is littered with false dawns. For every legitimate ‘ New Maradona’, there are thousands of ‘New Zidane’ and ‘New Bjorn Tore Kvarme’s’ who eventually – after being blinded by the dazzling media attention and left to stumble down their respective countries League pyramid – find themselves at Dumbarton as part-time striker, full-time groundsman/Kitman/Barkeep. When the lights stop dazzling, it’s easy to get dizzy and take a wrong turn. It isn’t a pitfall that is exclusive to trigger-happy managers or cash-flagrant clubs. Every club, never mind the League nor the Gaffer at the helm, has found that not everything that glitters is gold – and that an agents promise that his client is truly the incarnate of Puskas’ talent – is often just the same phooey that is bandied around at every contract meeting but with extra glitter. Just a few off the top of the list – Bruno Cheyrou to Liverpool. Hugo Viana to Newcastle. David Bellion to United. Kleberson to United. Djemba Djemba to United ( notice a pattern? ) and we can’t mention massive letdowns without including David Bentley at every club he ever played for. Arsenal don’t escape the curse of spilled banknotes and fans extinguished expectations. Especially in the last few seasons. Andre Santos. Gervinho. Amaury Bischoff. The Amazing Disappearing Wellington. Ryo Miyachi. The indomitable Francis Jeffers. Arguably Andre Arshavin. We now have another bright starlet in our midst. A player to hang all our wishes upon. A kid with hopefully wide shoulders to carry thousands of hopes atop. If he crumbles then no matter, we can palm him off to Auxerre or Bastia for the Next-Next Vieira. 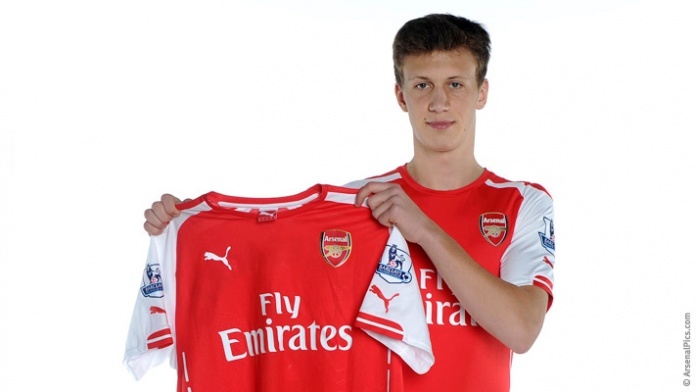 Rumours abound though, that Bielik IS in that very mould. Bielik is a Gunner. Who? He is rather rangy and has shown enough defensive discipline that he can be used as emergency centre-back when the inevitable time comes that all of our defenders get stricken with chicken pox. His specialised position is holding midfielder and the talk is that he will be immediately thrust into the first team squad. Seeing as our young Krystian only made his Legia Warsaw debut on August 24th 2014, this is not just a big leap but a gargantuan one. Not only is he meant to acclimatise to another country as a 17 year old young man, but he is also supposed to adapt to playing at the highest level after 6 appearances for Legia Warsaw. According to Wenger, he is more than ready. One gripe that is levelled at him prolifically is the amount of time he takes to sign a player. Scouts sent to watch targets so often, they end up buying a season ticket. The reason for this? It isn’t indecision. It is to see how the player deals with nearly every eventuality on the pitch, to check whether – amongst the minutiae of compulsions and muscle memory – the player has a fault. Grimandi and Rowley no doubt are so familiar with Bielik that they can confidently claim that the kid has all the assets to succeed. Age after all, is but a number. Theo was signed as a 16 year old and Jack, Ramsey and The Ox all made their debuts as teens. We may err on the side of caution, but if after 6 appearances for Legia Warsaw Wenger thinks he is Arsenal material, then he must be made of the right stuff. Add in the fact that if he had waited until the summer, after maybe another twenty or so appearances, then his stock would have risen more and therefore other clubs would come sniffing. So he would have had to act quickly. I look forward to seeing him flourish for us. He will be nurtured and given every opportunity to succeed and make a name for himself, eventually earning his dream move to Barcelona after four years. What a prospect for ‘ The New New Krychowiak’. Match Report Vs Aston Villa – The Perfect Win? Stamping Out Stamping – Time for Punishment.